The channeling session took place at Golden Lane with 3 guests present. I had prepared questions concerning the Bible and anticipated a master guide would come present with religious answers. I have added historical notes in red print to help clarify the messages. • I ask for a master guide – BEHOLD I AM OF THE LIGHT. • Do the Cardinals know who will be the Pope – THERE ARE BUT A FEW CHOICES. • May we ask questions concerning the Bible – I WILL AS I AM ABLE. • Yes, I am asking for a history lesson – STORIES COMPILES WITH FACTS. • Who will bring forth the information – IT WILL COME FROM UNSUSPECTED SOURCES. • Did Obama have anything to do with the 2007 murder in Chicago – THIS IS NOT MY DEPARTMENT. • Should we stick to Bible questions – YES, AND YOU MAY CALL ON ANOTHER FOR SUCH QUESTIONS. • Why does the Westboro Baptist Church practice hate in the name of God – SELF FULLFILLING. JESUS TEACHINGS ARE ALL THERE IS TO UNDERSTANDING GODS WORD. • We have guests that would like to receive personal messages – I WILL STEP ASIDE AND YOU CAN ASK FOR ANOTHER GUIDE. 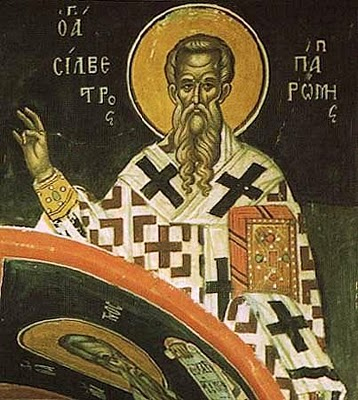 Pope Sylvester I served as pope from January 314 to December 335, succeeding Pope Miltiades. He filled the See of Rome at an important era in the history of the Catholic Church, yet very little is known of him. During his pontificate were built the great churches founded at Rome by Constantine, e.g. the Basilica of St. John Lateran, Santa Croce in Gerusalemme, St. Peter's Basilica, and several cemeterial churches over the graves of martyrs. ALL RIGHTS RESERVED. ANY INFORMATION, PHOTOGRAPHS AND OPINIONS ARE THE EXCLUSIVE PROPERTY OF BARRY STROHM AND ANY USE IS STRICTLY PROHIBITED. • You were Pope during the First Council of Nicaea in 325 when Constantine selected what books were in the Bible. I understand that many gospels were omitted – THERE ARE MANY GOSPELS MISSING. • Why were they left out – THERE WERE FEARS. • What were some of the secret teachings of Jesus that were lost – REINCARNATION, IT WAS ALWAYS IN THE OBVIOUS. • Are you referring to reincarnation – THERE WERE OTHER TEACHINGS THOUGHT TO BE TOO STRONG FOR BELIEVERS IN GOD. • Why were the teachings to be kept secret – THEY WOULD NOT FEAR GOD. AS YOU SEE IT IS THE CASE AT PRESENT. • So Jesus did not want to complicate his message. He just wanted people to believe – PRECISELY. REMEMBER ALL THINGS ARE POSSIBLE. WITH THAT SAID THEY ARE TO KEEP LAW AND ORDER. • Are gay people born like that or is there a choice – WE ARE FREE TO CHOOSE. • How are gays treated in Heaven – THEY MUST REPENT AS ALL SINNERS MUST DO. ANOTHER SECRET TEACHING, HEAVEN IS VISIBLE. IT IS NOT UP IN THE SKY, IT IS THE SKY. DIFFERENT DIMENSIONS WITHIN. DO YOU UNDERSTAND? • Spirits are all around us in the sky but in an unseen dimension. God created the sky and the earth – YES, UNIVERSE. • Why have Barbara Lee and I been chosen for this honor of speaking with you – YOU HAVE BEEN WILLING TO SPEAK FOR GOD. • Is there anything else we should be doing – PREPARING OTHERS TO RESTORE THEIR FAITH IN GOD. LET ME SAY UNTO YOU CHRIST JESUS WILL RETURN. • How will he return – IN THE SKY. HEAVEN WILL OPEN UP. • Will it happen soon – YOU WILL SEE THE SIGNS. THEY WILL BE UNMISTAKABLE. • Should we prepare people for this – YES, THE WORLD IS NOW OVERCOME BY SATAN. • I have tried to share our messages with ministers but they say we are doing the work of the devil and are not interested – THEY DO NOT UNDERSTAND THAT WHICH THEY PREACH. THEY FEEL THEY ARE RIGHTEOUS. THEY ARE CLOSE MINDED. • How can we open their minds – THEY CANNOT BE TURNED BUT THROUGH EXPERIENCE. • I want to do live internet broadcasts. Will the guides help us – IT WILL TAKE TIME. MAKE CERTAIN YOU HAVE A GOOD PLAN AND DEVOTE IT TO GOD. ONCE YOU BEGIN, YOUR CANNOT DIGRESS. • Should we include personal readings as part of the broadcast – NOT IF YOU ARE GOING TO BRING FORTH MESSAGES FROM THE HOLIEST. • I want to make sure we are interpreting you correctly – YOU CAN DO EITHER THOUGH NOT BOTH AT ONCE. • I would like to thank you on this day we celebrate the resurrection of our Lord. GO IN PEACE.